Should the electrical circuits at my home be tested monthly? If so, should anything else be tested on a routine basis? Yes, GFI outlets should be tested monthly, as their label suggests. This is an easy test that can be performed by the homeowner. Other maintenance checks or service visits can and should be conducted by the homeowner and a professional electrician on a routine basis. We’re all familiar with the little notice on our electrical outlets that says, “Test monthly,” but few people may know what it’s all about – and even fewer may actually perform the test on a monthly basis. You’ll find “Test monthly” stickers on any electrical outlets or circuits that are protected by ground fault interrupter (GFI, sometimes also called ground fault current interrupter, or GFCI) technology. And you’ll generally find GFI outlets in particularly sensitive areas of your home, like in bathrooms, kitchens, or outdoor decks. GFI outlets are designed to stop electrical current if a short circuit is detected or if someone is getting shocked. The concept is similar to a circuit breaker; the difference is that GFI outlets are much more sensitive to small changes in the circuit’s electrical current than the main circuit breaker. Thus, GFI outlets are an essential safety feature in modern homes. To ensure proper operation, GFI outlets should indeed be tested at least monthly. The test is easy to perform: simply press the TEST button on the outlet. If working properly, the circuit will be tripped, and the RESET button will pop out on the outlet. Simply depress the RESET button and you’re good to go! 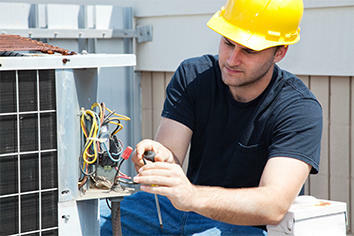 If not working properly, be sure to contact a professional electrician right away for service. In addition to GFI outlets, several other safety features can be found in your home’s electrical system. For example, all newly-constructed homes are required to include tamper-resistant outlets that make it very difficult to stick a sharp object inside the outlet and subsequently be shocked. Outlet plugs or covers can be purchased for older, existing outlets to help prevent accidental electrocution; additionally, older outlets can be upgraded to newer tamper-resistant models. Circuit breakers (located in that gray panel that’s probably in your garage or basement) have been around for a long time, but often don’t get much attention. Some homeowners may find it beneficial to “exercise” their circuit breakers from time to time. When practical (i.e. when you won’t accidentally interrupt electrical service to an important circuit in your home), simply turn the breaker off and then back on. If performed routinely, this helps ensure the breaker’s proper working order. Additionally, routine maintenance checks by a professional electrician help ensure the safety and good working order of your home’s electrical system. For example, an electrician can take a look inside your home’s electrical panel to ensure that its wires show no signs of heat or wear, that its wires are tightened appropriately, and that there is no water leaking into the panel or rust being created. If your home has upgraded or more complex electrical features (such as a whole-home surge protection system or an emergency standby generator), these should be checked and/or serviced at least annually. Your home’s electrical system is a critical component of your everyday living – yet its maintenance often gets overlooked. Be sure to perform homeowner-safe, routine tests on your own, and call a professional electrician for assistance with more complex maintenance checks and service visits on a regular basis. For professional assistance with this and other home maintenance work, Tuckey is the local expert to call. Keep our number handy – you never know when you might need us! Call (717) 524-1136 or visit www.tuckey.com for more information.